Facts about Briard Dogs, "Scientific name for Briard Dog, or domestic canine, is Canis lupus familiaris". The Briard Dog is a herding and guarding dog originating from France. They have an astute sense of smell and hearing making them excellent watchdogs. The Briard Dog is quite reserved with strangers but lovely and friendly to the family members. In early times, Briard dogs were used to defend their homes from poachers and wolves. After the French Revolution, the Briard dogs worked into more peaceful tasks of herding and being a guard dogs for there owners. It was used by the French troops in the World War I as a working dog. The Briard Dog used to be messengers, sentries, armor carriers and even medic dogs. The Briard Dog coat is long and luxurious which can of any solid color except for white. It shows great success in his agility, conformation and carting. The Briard Dog are large muscular dogs built for guarding and herding. The Briard Dog male show proportionate bodies in terms of height and length while the females have slightly longer bodies. With a straight topline, the head is rectangular, long and large having a wide muzzle characterized by long beard and mustache. All dogs are identical in makeup big or small– 42 permanent teeth and 321 bones. Puppies have 28 teeth and when they become adult dogs they have 42 teeth. Female dogs are in heat for matting for about 20 days twice a year. 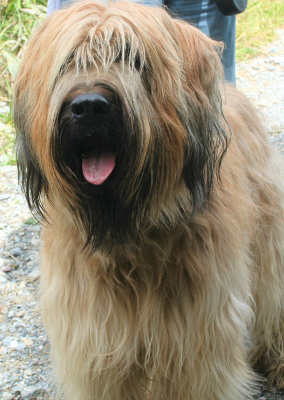 The Briard Dog teeth meet in a scissors bite but the black to black-brown eyes are widely set just above the square-shaped nose having open nostrils. Briard Dogs have two times the amount of ear muscles than people. A Briard Dogs can hear a sound at four times the distance of a human. Sound frequency is measured in Hertz (Hz) Def-Hertz is the measurement of frequency, explicitly it's one cycle per second. The higher the Hertz are, the higher the pitched the sound is. Dogs hear best at 45,000 Hz to 65,000 Hz, while humans hear best at around 20 Hz to 20,000 Hz. The Briard Dog eyes are large and covered with hair, which normally cascades the all body. His powerful legs, which are held firmly by the strong bones features large, round and compact feet below with black nails. The Briard Dog ears are cropped. Briard Dogs sweat glands are between their paw pads. The Briard Dog is an intelligent dog willing to be trained at any time. Its lovable character makes him a good companion. The Briard Dog are quite protective breeds who are often reserved with strangers. With their excellent memory, they are able to remember all the family members throughout its life. The Briard Dog are strong-minded and obstinate dogs if they are handled roughly. Briard dogs are covered by a double coat, which is hard, dry, and course, sometimes lying flat and falling naturally in wavy, long locks. While the undercoat is soft and intact in all parts of the body, the outer coat is defined by various solid colors (black, shades of grey and various shades of tawny) except for white. The Briard Dogs coat is long and thick, giving the Briard a bushy look. The number one heath problems amongst Briard Dogs is obesity, so always make sure your dog doesn't get to fat. Many foot problems that Briard Dogs have are just an issue of long toenails. Briard dogs are generally healthy breeds though they can be prone to hip dysplasia, gastric torsion, eye complications, (VWD) Von Willebrand's Disease, and even hypothyroidism. Doing regular brushing is recommended because of its thick coat. Haircuts, nail trimming, bathing and eye and ear care should be done occasionally. These breeds can live up to 14 years. The Briard Dog belongs to the Herding Group and in 1928 was recognized by the (AKC) American Kennel Club. If purchasing a Briard Dog from a breeder, make sure to find a good breeder with references check at least two to three of the puppies that were purchased from this breeder. Briard Dog’s nose prints can be used to identify them, their nose prints are like a humans finger print. A Briard Dog smells more than 1,000 times stronger than that of a human. A dog’s nose, secretes a thin layer of mucous that helps it absorb scent, after that they lick their noses and sample the scent through their mouth. A Briard Dog is an omnivore, (definition-they eat both other animals and plants). All Dogs are direct descendants of wolves. Briard Dogs pant to keep cool with 10 to 35 breaths per minute with an average of 24 breaths per minute. A large dog breed resting heart beats between 60 to 100 times per minute, and a small dog breed’s heart beats on average between 100 to 140 pant a lot. A Briard Dog’s mouth can apply approximately 150 to 200 pounds of pressure per square inch and an American Pit Bull Terrier, German Shepherd Dog and a rottweiler can have 320 LBS of pressure on avg.